The value of your home will increase and build equity. Possibly provide a little nest egg for your future. Tax deductions! The interest on your mortgage and your property tax payments are tax deductions. Please consult your tax preparer for all deductions that are applicable to you. Your home purchase is based on a fixed-rate mortgage, so no hidden or unexpected costs. No Rising mortgage payments. Again, most home mortgages are Fixed-Rates so usually, a more stable situation, rather than renting. Although, your property taxes and insurance can slightly increase or decrease, your mortgage payment will always stay the same, where as with renting, there is normally the dreaded increase on your monthly payment each year. Your very own privacy. No management company or landlords to answer to. Nobody other than you will be allowed to enter your home. There’s pride in homeownership and community. You can customize and detail your home to reflect your individual personality, taste and liking. Pride equals value. No Penalties if you should choose or need, to up and move. Most rental leases tie you up for 6 months to 2 years and have penalties if you leave the lease before it is up. When you own your home, you can simply sell and benefit from your equity that you gained during your ownership. Choice! You can choose a home that best accommodates your life style and taste. Also, your choice of location is key for comfort, convenience and community. Affordable options do exist. Some prefer to purchasing a lower cost smaller home to start out. You may decide on a 3-5-bedroom home, or a home that needs repairs or upgrades that is right for you. Project homes can greatly increase your value. Whereas, others would rather a condominium for less exterior and grounds maintenance. 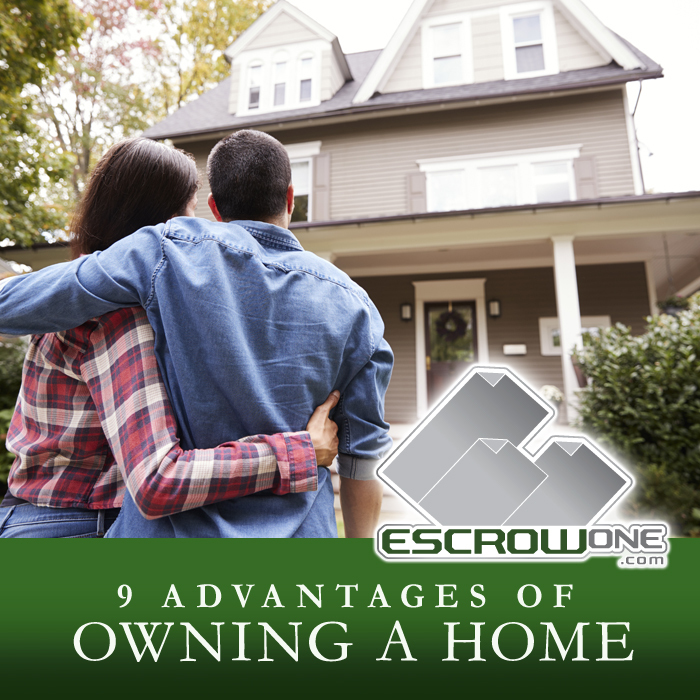 As always, EscrowOne, Inc. is there to help you with this important decision of purchasing the home of your choice by providing you with excellent Escrow Services. We pride ourselves with prompt and accurate service that will guide you through the Escrow process with ease. Please contact an EscrowOne, Inc for any additional information.